Steven Gerrard put the cherry on top of a perfect charity game between Liverpool’s Legends and AC Milan’s Legends, by scoring a superb solo goal to win the game for the Reds. Liverpool fans were treated to an afternoon of pure thrills when Liverpool’s Legends faced off against AC Milan’s Legends, the star studded charity match took place at Anfield today and the likes of Gerrard, Michael Owen, Robbie Fowler, Jamie Carragher, Andrea Pirlo, Cafu, Gennaro Gattuso and Kaka were all in action. 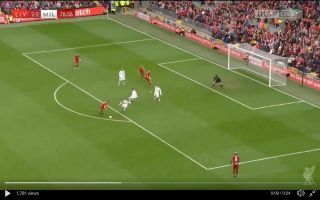 In the last minute of the clash, Gerrard showed that he’s still got it by turning one of AC Milan’s defenders before fooling the defender once again with a lovely fake shot and then firing towards goal to score a last minute winner for the Reds in front of the KOP. Thrills all over the Liverpool faithful. Rangers might have a chance of stopping Celtic’s dominance of Scottish football if they can get Gerrard to dust off his boots next season.